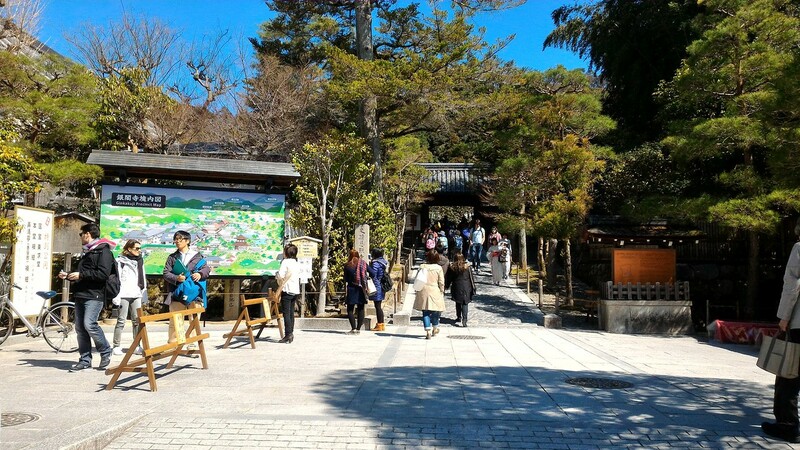 The one-hour roundtrip hike from Ginkaku-ji Temple up to the viewpoint on Mt. 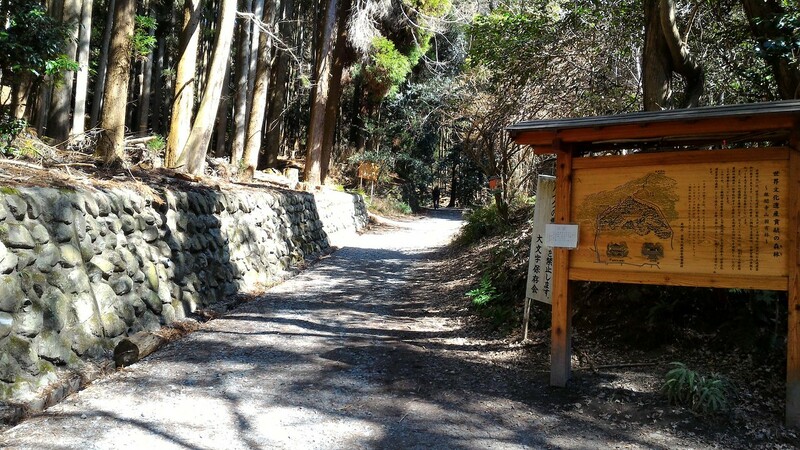 Daimonji-yama is the best short hike in Kyoto. The view of the city from here is incredible! Here is everything you need to do this hike. 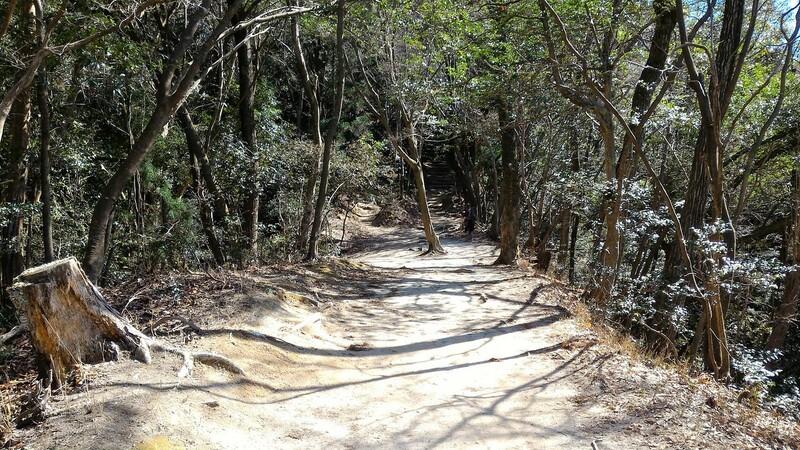 This hike is my favorite hike in Kyoto. I’ve done it literally hundreds of times. It’s just the right distance and vertical rise for a good daily workout. The total vertical rise from the main gate of Ginkaku-ji Temple to the viewpoint is about 220 meters. It’s a fairly steep ascent, but the climbing is broken up by nice, gentle level sections where you can catch your breath. It’s possible to continue up to the true summit of Mt. Daimonji-yama in another 20 minutes from the viewpoint, but it’s not really necessary to get a superb view over the city. Get yourself to Ginkaku-ji Temple in Northern Higashiyama. Walk up to the area just outside the gate, but don’t go up into the temple. Turn left before the main gate of Ginkaku-ji and walk north toward the two stone torii (Shinto shrine gates) visible about 100m away. These are the gates to Hachi-jinja Shrine. Turn right just in front of the first torii and walk east, up the hill toward the mountain. 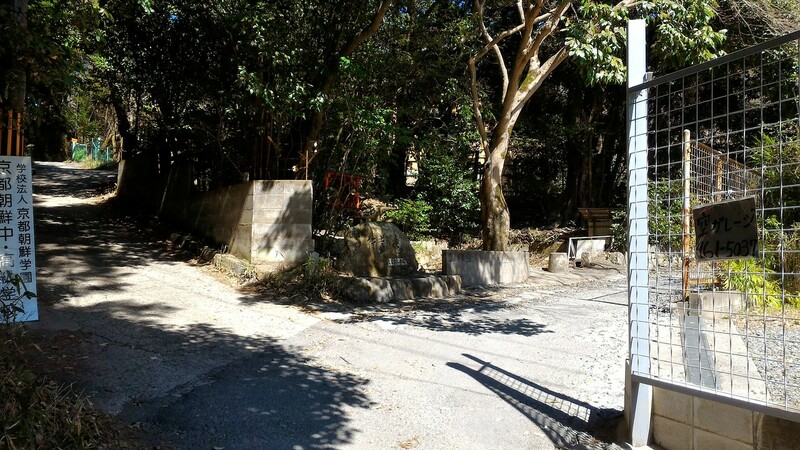 You’ll pass a small bicycle parking area and then come to a fork in the road, at which there is a small Shinto shrine. 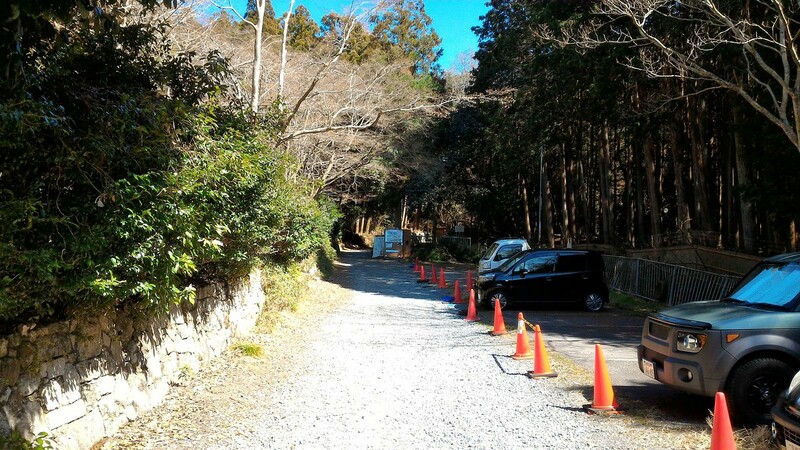 Take the nearer road that quickly enters a parking lot (ie, keep the shrine on your left). Walk up through the parking lot toward the vending machine and enter the woods. Walk into the woods on the broad trail. You’ll pass a signboard on your right after entering the woods. People leave hiking sticks here. Grab one if you like walking with a stick. After climbing the broad hiking trail for a few minutes (about 150m), you come to some steps leading to a bridge on the right. 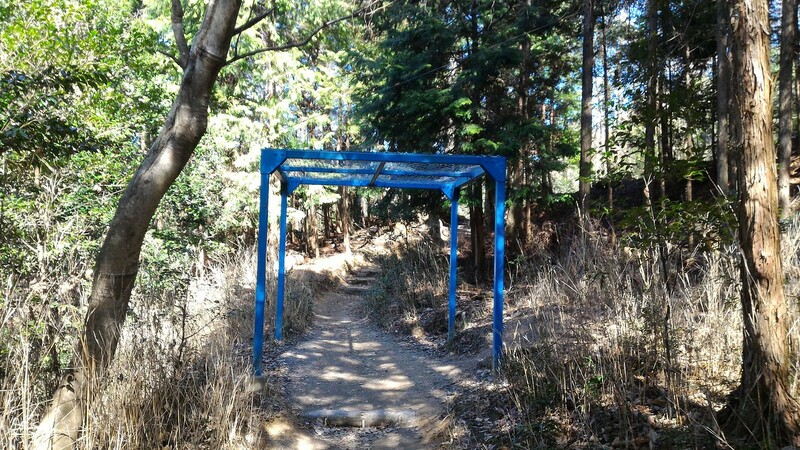 Cross this bridge (ie, do not continue straight along the broad path). Immediately after crossing the bridge, you must climb three flights of log steps. After ascending these, you come to a nice flat section where you can catch your breath. 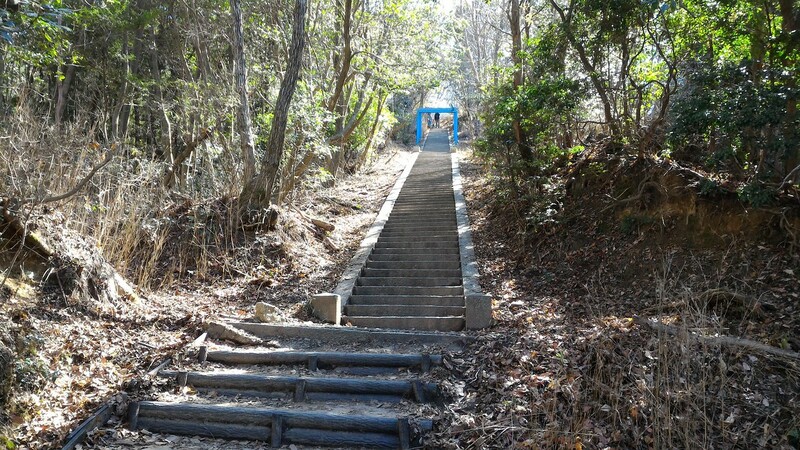 After catching your breath on the flat section, you begin the second climb, which consists of about 50m of log steps. After ascending the second climb, the trail levels out and you get some nice views over the city. 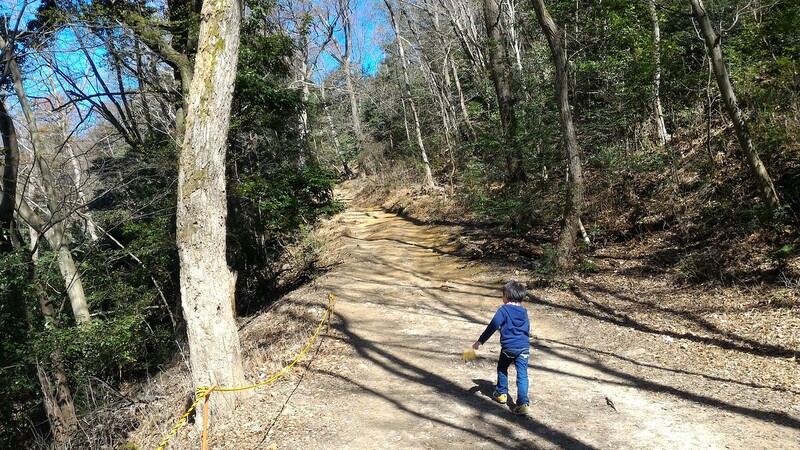 The slope falls away steeply on the edge of the trail here, so keep a hand on young kids. After this flat section, there is a gentle scree slope that you must climb to a saddle where several trails meet. 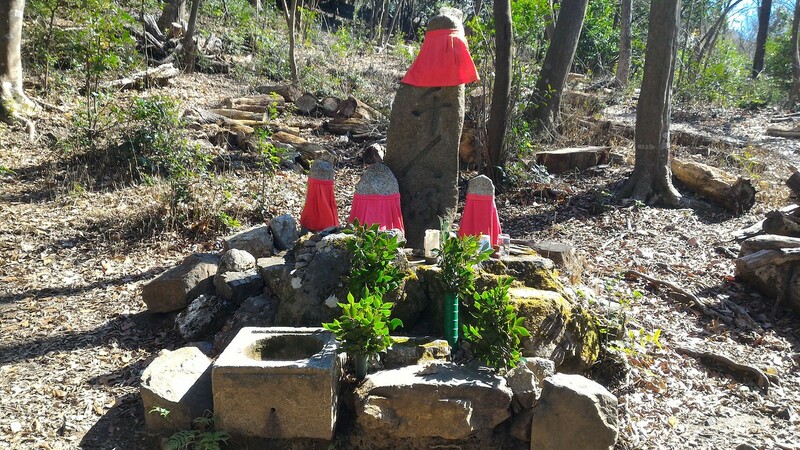 At the top of the scree slope, on the saddle, you will find Sennin-zuka, a monument to people killed during the a civil war in the 15th century (the Onin War). 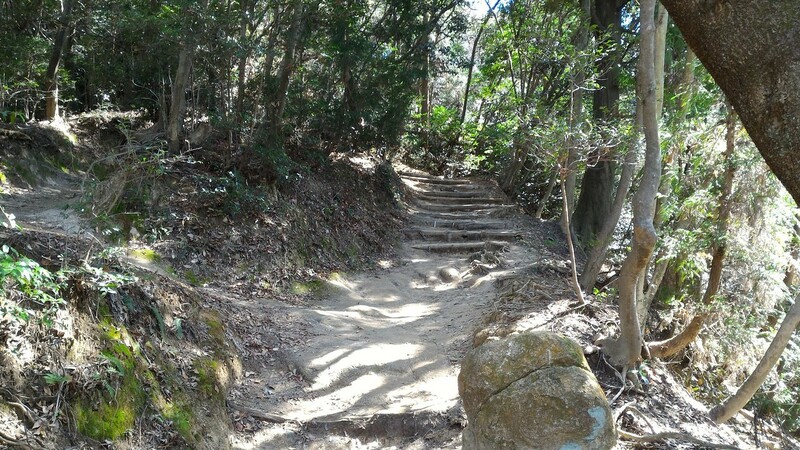 When you’re facing the Sennin-zuka, walk to your left along the broad path that ascends to the north (so, that you will have done one switchback). You’ll soon come to a blue metal frame, over which two cables pass. This is the lift that is used to bring the logs up the mountain for the August fire festival held on the mountain (see later on). Soon after, you’ll come to the base of the stairs that lead up to the viewpoint. These three flights of concrete steps are the crux of the climb. Once you’ve surmounted these, you’re basically there! After climbing the concrete steps, you get a nice flat bit to catch your breath and then you must climb some easy steps to the viewpoint. 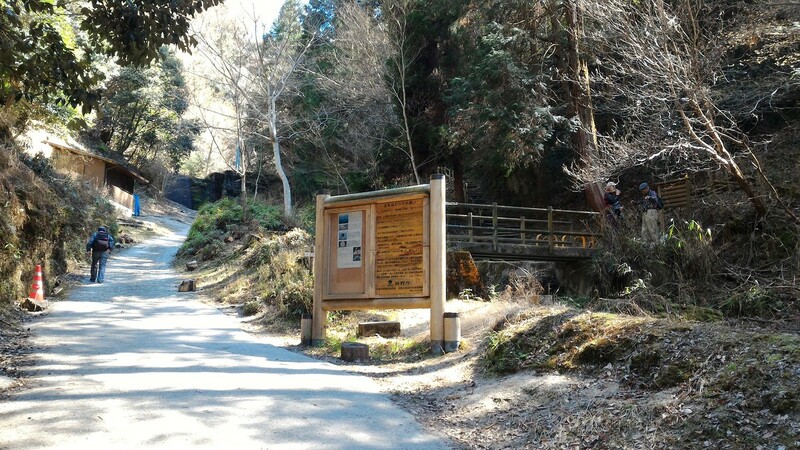 After these last steps, the trail comes out onto the Daimonji viewpoint and the view of the city opens up on your right. 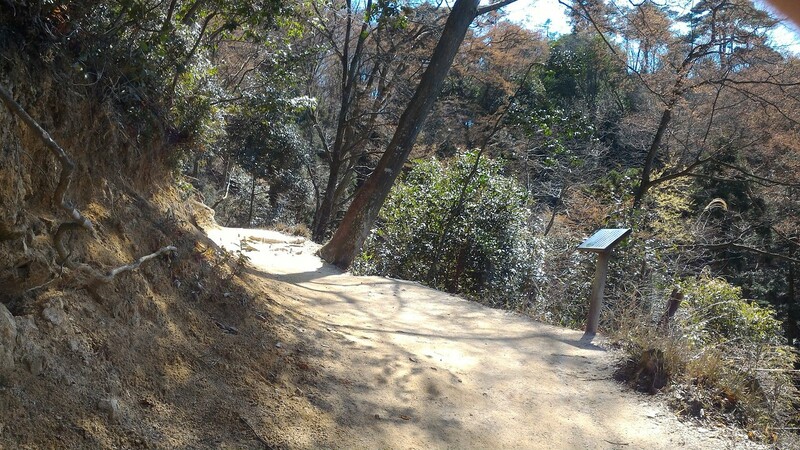 In the middle of the viewpoint, there is a small shrine to the Japanese Buddhist saint Kobo Daishi, which has a small enclosure and metal roof (good for shelter on rainy or windy days). 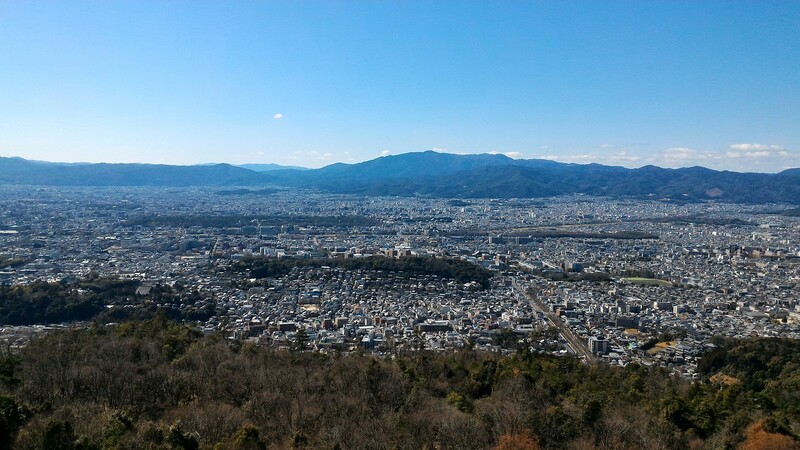 The view west from here takes in most of the city of Kyoto. 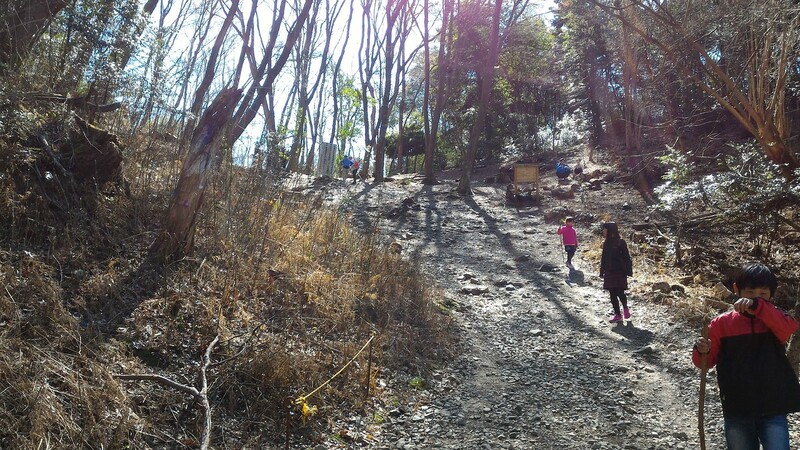 Immediately in front of you is Yoshida-yama Hill, which is actually two hills. 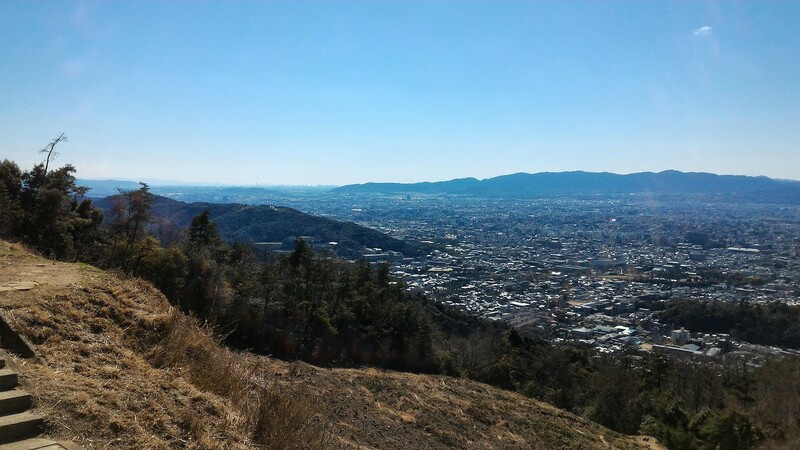 The southern bump here is properly known as Shiunzan (Purple Cloud Mountain), and it’s home to Shinyo-do Temple and Kurodani Temple (both pagodas are visible). Beyond that is the Kyoto Goshi Imperial Palace Park. Just before the Gosho, you can make out the Y formed by the meeting of the Kamo-gawa and the Takano-gawa rivers. 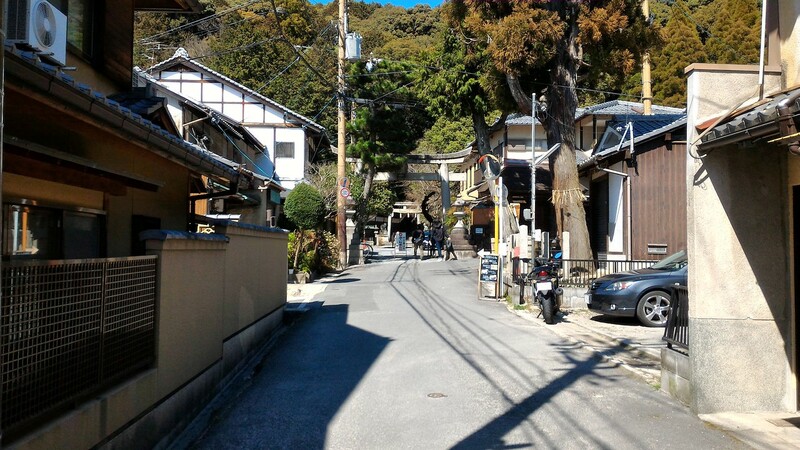 Against the base of the mountains in the west is the sightseeing district of Arashiyama, over which towers Mt. Atago-san. 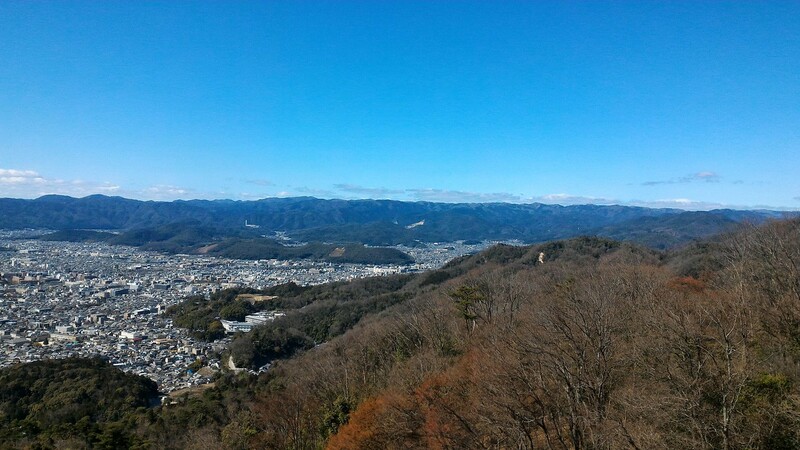 The view to the north here takes in the full range of the Kitayama (Northern Mountains) and the summit of nearby Mt. Hiei. You can easily make out three other mountainside characters where giant kanji are burned during the fire festival: the nearby pair reading Myoho (妙法), which means Buddhist law, and the more distant Funagata, which is the shape of a boat. To the south, you can easily see Kyoto Station and Kyoto Tower. 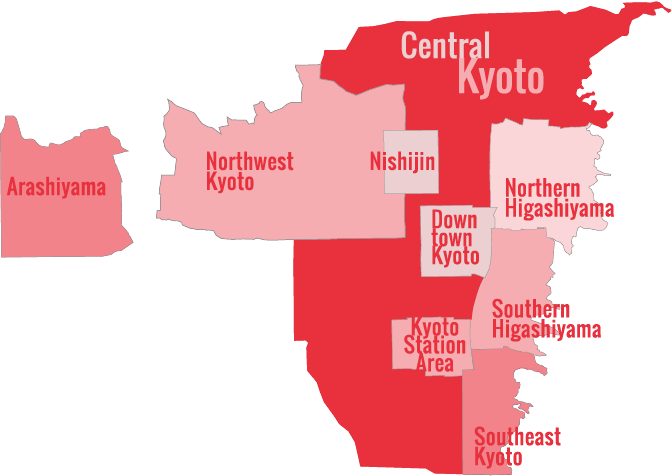 South of those are the suburbs that lie between Kyoto and Osaka. On a clear day, you can make out the skyscrapers of Osaka, the highest of which is the Abeno Harukas building (300m). And, on really clear days, you can see as far as Awaji-shima Island, which is the Inland Sea, on the far side of Osaka Bay. 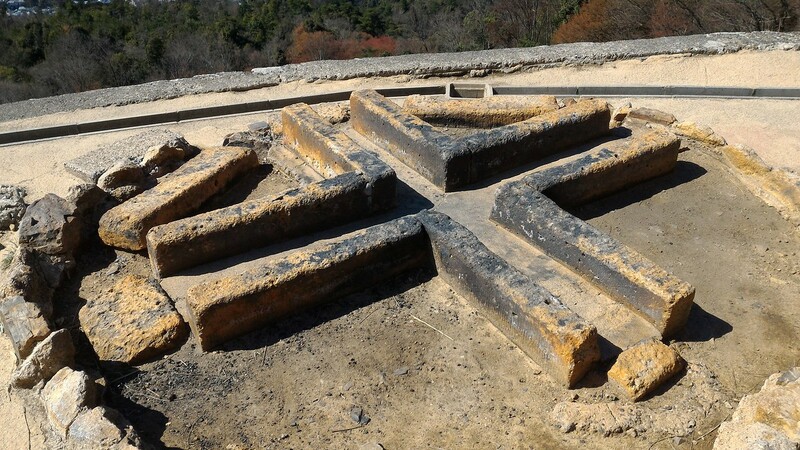 In front of the Kobo Daishi shrine, you will find an X-shaped fireplace (known as a “hidoko”) where one of the fires is burned during the fire festival. This is the center of the giant 大 (Dai) character. If you look up the hill, you will see the top of the character, while the arms stretch out to either side and the legs are visible below you. The fire festival is properly known as the Daimonji Gozan Okuribi (Daimonji Five Mountain Obon Fire) and it’s held at 8pm on 16 August. 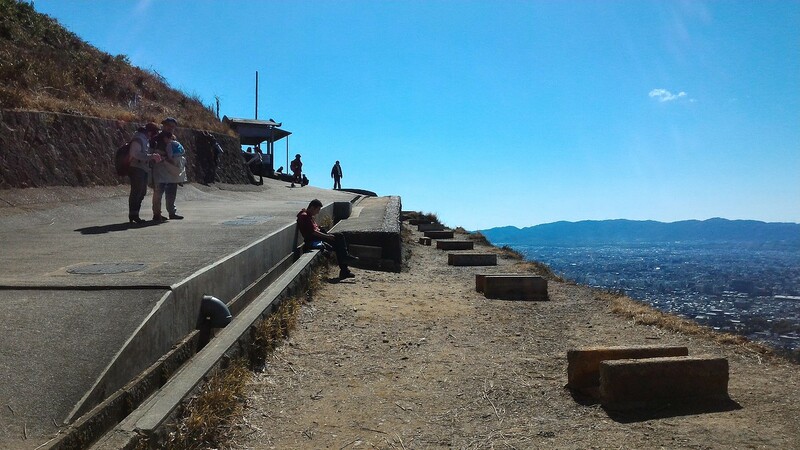 You cannot climb to this part of the mountain without special permission on that date. 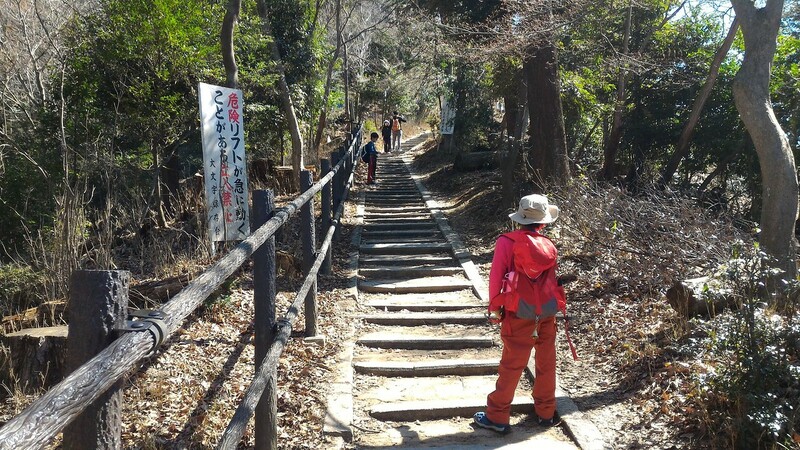 If you want more of a hike, you can climb the steps that ascend the top of the giant Dai character and then continue along the easy-to-follow trail for 20 minutes or so to the summit of Mt. 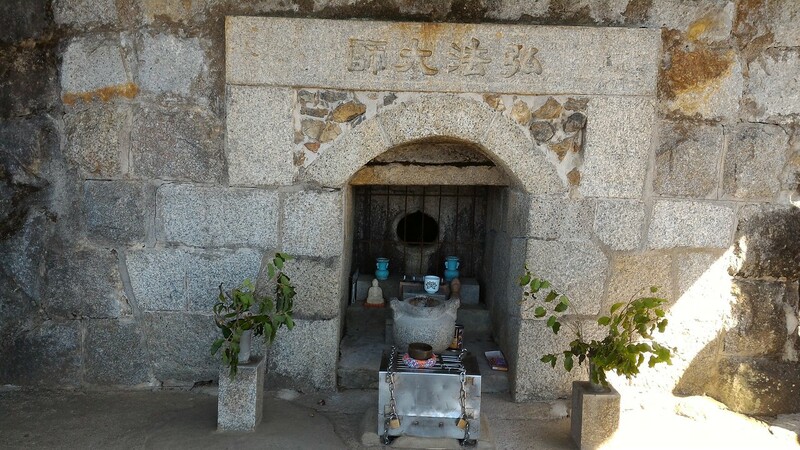 Daimonji-yama (properly known as Nyo-ga-take). Otherwise, simply return the way you came to get back to Ginkaku-ji. Here is a Google map of the hiking route.